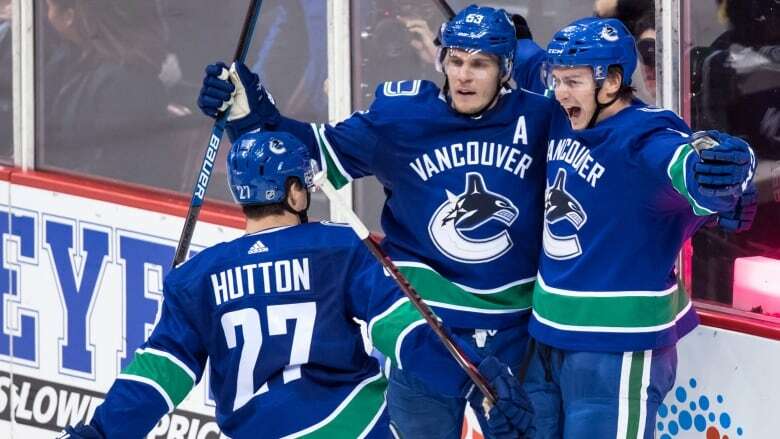 Before the Vancouver Canucks kicked off their season, head coach Travis Green said he wanted his team to "score by committee." They did just that on Wednesday when they beat the Chicago Blackhawks 4-2. Jake Virtanen, Brendan Gaunce and Antoine Roussel all found the net for the Canucks (8-6-0). "It's easier said than done but any team that wins in this league has secondary scoring usually," Green said after the game. "You need guys at certain times to step up. It's not one or two or three guys that can score every night." Jacob Markstrom stopped 24 of 26 shots for the Canucks and Corey Crawford turned away 24 of 28 for the Blackhawks. Virtanen scored twice, marking the first two-goal game of the 22-year-old's career. At one point in the third period, it looked as though he might have a chance to notch a hat trick. But the right winger said he didn't want to push it. Much of the Canucks' offence this season has come from 19-year-old rookie Elias Pettersson, who has seven goals and three assists in eight games. The performance is pushing others on the team, Virtanen said. "I feel like Petey's putting up a lot of goals and making plays. And for me, I watch Petey pretty closely," he said. "You see a young guy come in and score goals and it boosts you a bit. You want to keep up with a so-called young guy." The Canucks' go-ahead goal came from Gaunce halfway through the third period after he gobbled up a Blackhawks' pass. Turnovers were a problem for the Chicago squad on Wednesday, said head coach Joel Quenneville. The team got sloppy with the puck, Saad said. "A couple posts and unlucky bounces but regardless we have to tighten up defensively," said the left winger. "We give that team that much rush chances and time and space and they are going to capitalize. It definitely wasn't good enough defensively." Gaunce knew the turnover that led to a puck on his stick caught Chicago's goalie off guard. The resulting goal was the sixth of the centre's NHL career, with the last one coming on Feb. 1. He also registered an assist on Roussel's late-game goal. Wednesday marked Gaunce's first game with the Canucks this season. He was called up from the American Hockey League Utica Comets on Tuesday to help fill out a roster that's been riddled with injuries early in the season. "I want to be in the NHL and at the start of the year. I obviously wasn't so there was a reason for that," he said. "You come in here with the mentality that you're going to make a difference and you're going to kind of make them have to keep you." Gaunce capitalized on being called up on Wednesday, Green said. "When there's injuries, you can either move by it or its new opportunities for other players," he said. "And he's one of those guys that right now is getting a chance. And he did tonight and he took advantage of it." The Canucks have one bout left in their four-game homestand. They'll host the Colorado Avalanche on Friday.